Do your coupons expire before you ever remember to use them? That’s likely because of organization. Keep in mind, I’m a throw-it-in-a-box person but with coupons, organization is the key to savings. The most popular way of organizing coupons is by using the coupon binder. 1. Use a 3-ring binder: You can start with a 1″ then work your way up if need be. You can also use the old school Trapper Keeper’s too. 2. Baseball Card Holders: Baseball card dividers can be picked up at most hobby stores, Walmart, Target and Kmart. I love these on Amazon, they’re sturdy and perfect for multiple coupons. This is what you’re seeing in the picture on top. Honestly, this is the best way to organize your coupons in a way you can actually see them. Just fold them and tuck them in. You can stack them pretty deep too. You can add a calculator, scissors or anything else you’d prefer as well. Really, great organization is very personal, it’s all about what works for you. I’ve found this to be the most popular method and certainly the easiest one for me. 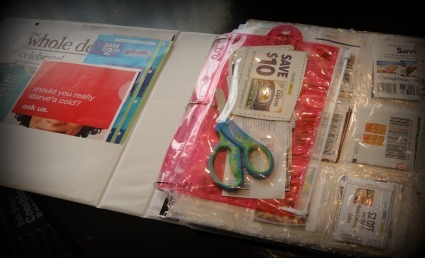 Coupon binders make it EASY to save money! Be sure to check out Favado and learn how to save on the go too! Favado is a new app complete with coupon matchups and coupons to your favorite stores. Bookmark our Coupon Matchup page as well for the BEST deals every single week! 20 years ago I would have loved this. I had so many coupons then and could never quite keep them organized. Now I’m an empty nester and don’t have enough coupons for a binder. Have you considered couponing for items for your local mission? Starting from scratch Just lost job in August after working for 8 years Need to save on groceries so I can use husbands pay on house bills Thank you!!! I started couponing about 2 months ago…I have 3 toddler boys and decided To start as a hobby But a good way to help my family. Iget so excited about saving money and Feel Accomplished as well. It is a satisfying hobby. Thank you for your tips I am putting my first organizer together. Just starting out and very excited. Found a couple local groups to work with. They are fantastic. Always seeking new information and ideas. I am an organizer. Hey! What groups do you work with for couponing? I’m going to start. How do I get coupons without buying papers? What web sites do you use to get more coupons? Thank you!! @Sharyn Visit manufacturer websites directly for coupons also CouponDede.com is great for coupons! Also, Sarah, thanks for your advice! Very helpful! On Sunday’s the dollar tree usually has the paper, and its only $1. I just downloaded my calculator icon to front of my phone… Less to haul around in binder. Ever since I began couponing, I have always searched for a better way to organize all my coupons. Like many people, I started out with an accordion style coupon envelope made of flimsy plastic that quickly split open and also made finding any coupons very difficult. I ended up not using the coupons that I cut out because it was too much effort to search through my piles of coupons to find the ones I needed. 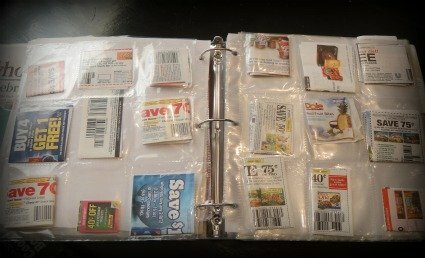 Trust me, if you are considering starting up couponing, you must begin this way by using a binder where you can view all of your coupons. Will it take a little bit more time each week as you place them into the folder? Yes. But it is well worth it. I’ve been using paper clips and an envelope to this point and need something better, so I am going to put a notebook together. We need to track categories as well as dates. Any tips on keeping the dates organized? Or is that just pure discipline going through the book every week? It’s a lot of discipline. Also I used dividers in my notebook, I also had a box like a file folder box that I would put inserts into sorted by dates when I used to get tons and tons of coupons. That helped a lot then I moved them to my binder when I knew I was about to use them.